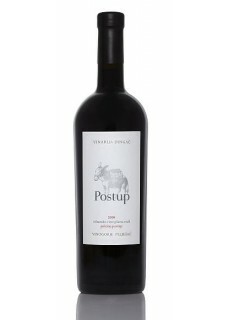 Postup is typically harvested later that Dingač and tends to be the more exotic concentrated wine. For some, too much so. Aromas of scorched rocks, dried fruit, reduced fig, plum and tobacco contrast with the sea scent. Powerfully structured and actually salty, tihs is unique expression of terroir. Founded in 1937 by 550 winegrowing households contributing as one collective, since the privatization which followed the end of Yugoslav Communism in the early 90’s the number has dropped to 300, but their challenges and successes are still shared. Today Vinarija Dingač produce 4 Plavac based wines the lighter “Plavac” and “Peljesac”, both sourced mostly from the cooler Župa Valley, small amounts of “Postup”, a special site classified in 67’, and the flagship “Dingač, Dingač”, to indicate both the winery and appellation.